This Puma Unleashed fifth wheel toy hauler dual entry 359-THKS by Palomino will get you and your toys to and from your favorite destinations in style! Let the rear 7'3" ramp door with spring assist easily help you load and unload. 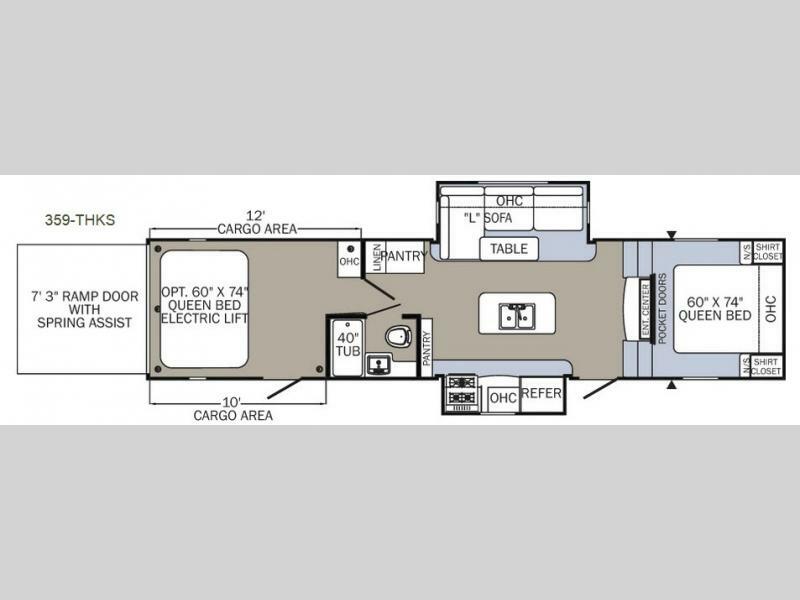 There is an optional 60" x 74" electric queen bed electric lift in the cargo space for more sleeping space if needed. There is also an overhead cabinet for storage, and a side man door for easy access when the ramp door is closed. The main combined living and kitchen space features dual slides opposite one another. In the kitchen there is a refrigerator and three burner range with overhead cabinets within the first slide out. There is a pantry off to the side for dry goods, and a kitchen island with double sinks for easy cleanup. 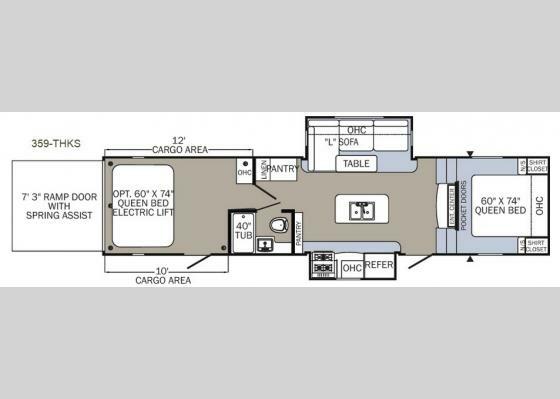 The opposite side features a slide out L-shaped sofa with overhead storage cabinet and dinette table. There is also a linen cabinet and second pantry off to the side of the slide. Across from the linen cabinet and pantry is a complete bath with a toilet, sink and 40" tub. Towards the front of this 359-THKS you will see an entertainment center surrounded by steps up to the front bedroom. The bedroom can be accessed on either side through dual sliding pocket doors. Inside you will find a comfy queen size bed with nightstands and shirt closets on both sides. There is also an overhead storage cabinet, and so much more!